In Loving Memory of Fred we will miss you. Well hello there. 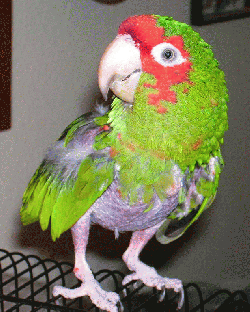 My name is Fred and I`m a mitred conure. I was surrendered by my former owner to a shelter. From there I went into a wonderful Mickaboo foster home. My prior owner told the shelter that I am 25-years old, but the Mickaboo folks aren`t so sure. My first foster mom has already discovered I will step up, but am nippy if you try to do something I don`t like (like putting me back in my cage), that I love head skritches, to chatter when talked to, and that I love to dance and whistle to music! I prefer a seed diet, but now I`m in my long-term foster home and my foster dad is working on teaching me about new healthier foods like pellets and greens. People call me "energetic and spicy" and are sure it won`t take long for someone to fall in love with me. And although I seem to prefer men to woman, I get along ok with either, really. If you think that you might be the perfect person to be my forever-home, click the link below to email Mickaboo`s Conure Coordinator!